Our last post on 'baseline' or 'continuation' budgets generated a fair amount of comment, mostly positive, simply because it pulled back the curtain on the budgeting process in North Carolina and virtually all government accounting from Washington to every state capital. It showed just how much of a sham the 'continuation budget' really is when it comes down to it. Budgets must be compared against what was spent in the previous year. NOT what was 'hoped for' or expected to be spent next year by a legislative body two years ago! How nonsensical is that? 'Continuation budgeting' is like saying you 'cut' your spending when you opted to buy a used car due to financial constraints in 2009 when your 'baseline' 'continuation' growth budget in 2007 suggested you could afford a new Mercedes instead when things we going great, or so it seemed. You didn't 'cut' one dime of 'spending'! You still bought a new car, 'new' to you at least. You paid out more money than you spent the year before. Just not as much as you would have had to have paid for that shiny new 2010 Mercedes. 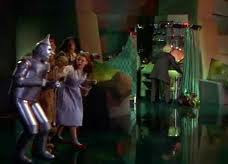 'The Great and Mighty Wizard of Oz!' would have been mightily impressed by the machinations, subterfuges and misdirections of the media and the protesters who have thrown up such a howl over this year's legislative actions in North Carolina. 'The media says the Republicans have 'cut' education spending by $500M – really? FACT: We increased K-thru-12 education spending by $361 million. Again, just to reiterate, we raised public education spending in the state of North Carolina by $361M. Not cut it one dime relative to the year before. In 2014, we will go over $8 Billion in education spending. Under the recent Republican-controlled state legislature, education spending has increased every year. The media says we 'cut' the K-thru-12 public education budget by $500M. The exact number in question is $361,407,582.00. The problem is that $361M is the increase in spending we passed. Not any decrease. Year-over-year from 2012, this is the amount of money we have increased public education spending in the state of North Carolina for the next biennial (2-year) budget cycle. I did not get an 800 on my math SAT, but I am pretty sure those numbers represent an increase in planned spending - every year going forward. These numbers represent the most the state has ever spent in public education in the history of the state. To be fair, the media was not only off on their $500 million figure, they were off by $861 million in the correct education budget numbers! Under the Republican-controlled NC General Assembly since 2011, we have raised the public education budget every year. The Democrats ran ads before the change of control four years ago, that claimed that within a period of three years under the Republicans, there would be a cut of 20,000 teacher jobs. We have never seen total teacher jobs decline. Now, that all being said, there are plenty of opportunities to discuss the composition of these public education budgets. Those are the types of debates we should be having in polite company. Should teachers be paid more? Should every teacher be expected to be part-counselor, administrator, public safety officer, psychologist for every student in his/her class? How about the number of administrative positions now in abundance in public education? What would happen if they were cut in half and that money was reallocated to bolstering North Carolina teaching salaries? How many more reforms are needed to really inject our public school system with the energy and positive motivation that every student will use to become as educated as he or she wants to become? If you want to talk about raising taxes, shouldn't the first thing you discuss is how to squeeze every single efficiency out of the existing budget before doing so? Why raise taxes if you think there is 5%, 10%, or even 50% of the existing budget that is not producing optimal results? That would be like flushing hard earned tax money down the drain, wouldn't it? In any $8 billion budget, there are top-tier #1 priority line-items and there are many lower-tier line-items that get tucked away in it year after year after year...and never get examined or taken out. That is the nature of government. Ronald Reagan once compared government programs to 'the closest thing on earth to eternal life'. The Chinese and Indian brainiacs in their fast-growing economies could care less whether we use a 'continuation' budget or not to fund public education in North Carolina. They want to know if they are going to have to compete against North Carolina students for the jobs of the 21st century and whether the Tar Heel students will be any good or not at the things they choose to do. We will either meet that challenge or we won't. Who is ready for that debate to begin instead of this mudfight we have witnessed lately?